Blue GrowtH is a formula developed by Controlled Labs. It is a combination of herbs and nutrients in a proprietary blend that is supposed to enhance the natural production of growth hormone and help promote a deeper sleep. Do you ever wonder how bodybuilders and athletes look so ripped and fit from head to toe? They probably just have great genes or maybe they live in a gym, right? Or….it could be that many sports performers rely on HGH supplements to enhance their exercise and diet plan. Blue GrowtH is formulated with natural ingredients that stimulate the pituitary gland to produce more growth hormone, which is responsible for those lean popping muscles and wash board abs. Blue GrowtH is a product of Controlled Labs, a manufacturer that claims to know the sports business and wants to provide the right product that will enhance each performer’s specific need. How Does Blue GrowtH Work? The formula developed by Controlled Labs is a combination of herbs and nutrients in a proprietary blend that is supposed to enhance the natural production of growth hormone and help promote a deeper sleep. While you are sleeping is when the most production takes place. How Long Does Blue GrowtH Take To Work? Controlled Labs doesn’t go into any details about how long it takes to start seeing results. The dosage is 5 capsules daily (starting out at one and working your way to 5) at least 30-60 minutes before bed. According to current customers, it is suggested that you cycle off for a period of 2-4 weeks after every 8 weeks of daily use for optimal results. It is suggested that it may take a few weeks to two to three months before you notice visible results. Those who are taking Blue GrowtH say they can tell after a few days that they are sleeping better and have energy throughout the day. Controlled Labs tries to accommodate customers with products designed to meet their needs. 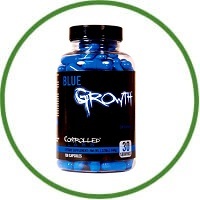 Blue GrowtH is a natural way to enhance growth hormone production. When you look at each ingredient and its function, Blue GrowtH looks more like a male enhancement supplement than growth hormone. Controlled Labs provides much more than some manufacturers, but it’s still not enough. Blue GrowtH is overpriced, the ingredients are in a blend, and there is no lab testing data.